The Gallery Walk is an icebreaker activity that exemplifies the principles that people already know a lot, including knowing what they need to learn, and, if this knowledge is elicited and affirmed, they become better at learning from others. As participants in a course or workshop arrive at the first meeting, they can be given marker pens, grouped in 2s or 3s, asked to introduce themselves to each other, and directed to one of a number of flip chart stations. Each flip chart has a question. Participants review the answers already contributed by any previous groups and add their own, then move on around the stations. When the first groups returns to where they began, volunteers can be recruited to summarize the main themes and contrasts on the flip charts—one volunteer to each flip chart. They present these to the whole group, with the aid of an overhead transparency or simply as they stand by the flip chart in question. A sheet listing the flip chart estions can be distributed for participants who want to take notes. What changes (big & small) are being pursued in teaching, schools, and educational policy? What kinds of experience prepare teachers, administrators, and policy makers to pursue change in constructive ways? What things would tell us that positive educational changes had happened? What do you hope will come from this semester’s experience? Example 2: Gallery Walk Questions used at the start of a year long professional development course for math and science educators to promote inquiry and problem-solving in a watershed context. What factors (big & small) are involved in maintaining healthy watersheds? What watershed issues might translate well into math. and science teaching? What pressures & challenges do you see facing teachers wanting to improve math. and science teaching? What has helped you in the past make improvements successfully (+), and what has hindered you (-)? What things would tell you that positive educational changes had happened? What kinds of things do you hope will come from this course/ professional development experience? Breaks the ice and introduces students who might otherwise never interact. Begins the community-building process so central to cooperative learning and emphasizes the collaborative, constructed nature of knowledge. Suggests to students their centrality in the course, and that their voices, ideas, and experiences are significant and valued. Allows for both consensus and debate – two skills essential to knowledge-building – and facilitates discussion when the class reconvenes as a larger group. Enables physical movement around the room, an important metaphor for the activity at the course’s core. Depending on the gallery walk questions, provides one way for the instructor to gauge prior knowledge and skills, and identify potentially significant gaps in these. Depending on the gallery walk questions, provides a way to immediately introduce students to a central concept, issue or debate in the field. Updated: 6-17-02, with revisions on 12-6-10. This entry was posted in reflective practice and tagged educational_change, group_process, ice_breaker, workshop on December 7, 2010 by Peter J. Taylor. 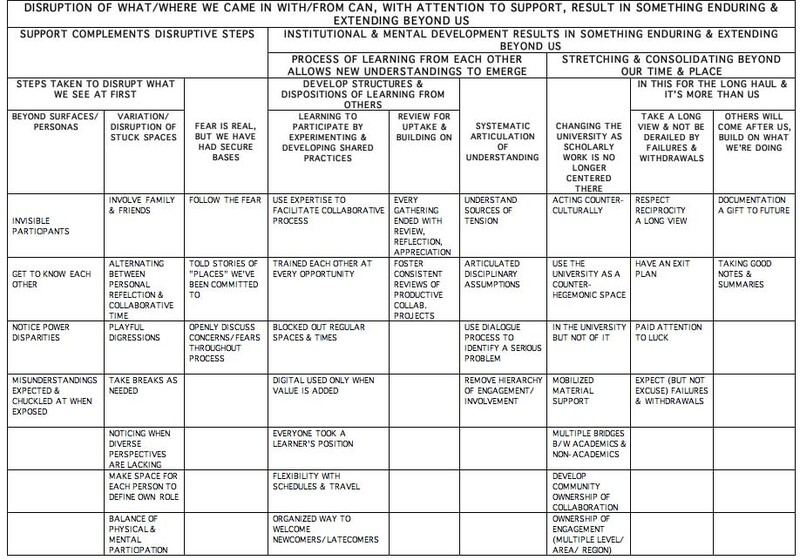 This entry was posted in reflective practice, Sci&TechStudies(STS) and tagged collaboration, complexity, group_process, reflective_practice, Sci&TechStudies(STS) on November 25, 2010 by Peter J. Taylor. 1. The majority needs to inquire about and come to understand the concerns of the minority. If the minority feels heard and understood, there is more of a chance that a path ahead can be found that all sign on to. 2. The majority does not rule, so there is no concept of a minority “blocking” a majority. 3. The leader is not a chief who can decide how to act on this/her own, but a spokesperson and advocate for the consensus. 4. Participants need to be sure about what the consensus is (e.g., through circulation of notes from the consensus-generating meeting) and promptly ask for another meeting if their concerns if they think the consensus has been incorrectly recorded or if they subsequently develop reservations. 5. Behind-the-scenes departures from the consensus are not helpful. 6. When leaders have to report to hierarchical (i.e., non-consensus) decision makers, they bring dictates/mandates back to the group to develop a consensus about how to respond and be in solidarity about that response. Although consensus decision-making can take time (and when pressed for time, voting tends to become a tempting fallback option), the virtues of consensus decision-making are that the participants are more invested in carrying out the decisions. Consensus decision-making is enhanced by pre-circulation of meeting agenda, all the relevant data, and documents that spell out the implications of alternative positions. This entry was posted in reflective practice and tagged collaboration, decision-making, group_process on September 13, 2010 by Peter J. Taylor. These questions were generated by software that analyzed my responses and then arranged the conditions from “deep” to “top,” where deeper conditions are helpful for the ones above them. This constitutes the structural model. Tom’s intention was only to introduce me to the concept, not to lead me systematically through the full process so I do not want to overinterpret the outcome. I include below only the deepest three layers and the top of the model to help readers picture a structural model. Let me simply draw attention to the deepest condition, “quiet spaces that occur are not filled up.” It is no small challenge for someone organizing or facilitating a workshop or organized multi-person collaborative process (OMPCP) to ensure that this condition is met. Conversely, if it is not met, it should not be surprising that the criteria for a successful workshop are not achieved. In the same spirit, given that I am interested in stimulating further inquiry about OMPCPs and, more generally, about the relationship between knowledge and inquiry — between product and process — I will say no more at this point. ii) participants’ subsequent work enhances the capacity of others to flexibly engage, that is, to connect with people who are able to take initiative-or are almost able to-in forming communities of practice/change collaborations that provide their participants experiences that enhance their ability to flexibly engage. participants get to know more about each others’ not-yet-stable aspects. participants’ energies are mobilized by the process. the plans allow for individual participants to select and focus on a subset of the workshop-generated specific plans or knowlege in their subsequent work. This entry was posted in reflective practice and tagged collaboration, group_process, interpretive_structural_modeling, workshop on September 10, 2010 by Peter J. Taylor. The emphasis on “involv[ing] heterogeneous components” poses a challenge for such a process view of knowledge-making and reassessing, thus the question this session aims to address. The emphasis on “cut[ting] across scales” also sets up a tension that concerns me, namely, taking seriously the participation of diverse people whose livelihood is directly dependent on an ecosystem or city or…, and, at the same time, acknowledging researchers’ professional identities and abilities as people who can contribute analyses of changes that arise beyond the local region or at a larger scale than the local. A 18 Feb. 2010 faculty seminar addressed these challenges through a post-it brainstorming and clustering (described elsewhere). In brief, to generate ideas on post-its participants were asked to: “Imagine a project you’re working on or and endeavor you’d like to pursue. It’s 2-3 years in the future. You meet a friend and are telling them how wonderful it is that the project is managing to ‘bring… into interaction not only a wider range of researchers, but a wider range of social agents, and [kept] them working through differences and tensions until plans and practices are developed in which all the participants are invested.’ The friend asks what has contributed to making that possible.” Each participant then grouped the post-its and named the resulting clusters, then grouped those clusters, etc. This is my synthesis. * This prezi can be viewed as a whole by zooming in or out using the + and – button. Or, by clicking the arrow you can trace the various pathways of the form addressing/acknowledging the lower consideration makes it easier to address the higher consideration. Or, by clicking the More button you can do this automatically and can see a full screen view. This entry was posted in reflective practice and tagged cardstorming, collaboration, fear, group_process, heterogeneity, reflective_practice, university on September 5, 2010 by Peter J. Taylor.